Caring for the skin of our elderly loved ones can be of high importance now in their aging years. With their sensitive and thinning skin, they can easily acquire skin infection, wound, or allergy. How do you ensure quality skin care to be implemented? Get assistance from professionals. Our team providing home health care in Columbus, Ohio is able to assist you in caring for your senior loved one especially with their skin. When your senior loved one is already eating fruits and vegetables most of the time, you’re already a step ahead in taking care of their skin. These foods contain natural elements that are healthy contributors for the elderly skin. If you like, you can increase their consumption of green vegetables, berries, walnuts, and avocadoes, as these contain skin-healthy nutrients. The skin of our senior loved ones can also be subjected to the complications caused by the ultra-violet rays of the sun. To prevent this, let them wear sunscreen lotion on the face and skin, and let them wear weather-appropriate clothing that can also cover their skin. This way, the UV rays will have little impact on their sensitive skin. When your senior loved one is sufficiently hydrated, their skin will also have enough refreshment. Water can also help the skin cells flush out the unhealthy toxins so that they can remain to be glowing and vibrant. Aside from water, you can also serve them with supple fruits and vegetable soup. Our care aides can also help you provide quality home health services in Columbus, Ohio. While your senior loved one can trim their nails on their own, it helps to double check to ensure that these are well-trimmed. Their nails may have sharp parts that can injure their skin when they scratch an itchy area. Minor scratches can be an entry point of infectious elements that can easily get complicated especially that a senior’s immune system is already declining. Soap and other bathing products can be harsh on your aging loved one’s skin. These can trigger irritation or allergy, which, when scratched, can result in injuries. While these injuries can easily be treated, seniors with diabetes may have long-term consequences from these minor wounds. Ensure that they’re using skin-friendly products. To help you get the right product, better consult with their physician. How do you find these skin care tips for your senior family member? These are just among the many skin-friendly steps from our team at Columbia Home Health Care that you can do to ensure that their skin is well taken care of in the aging years. 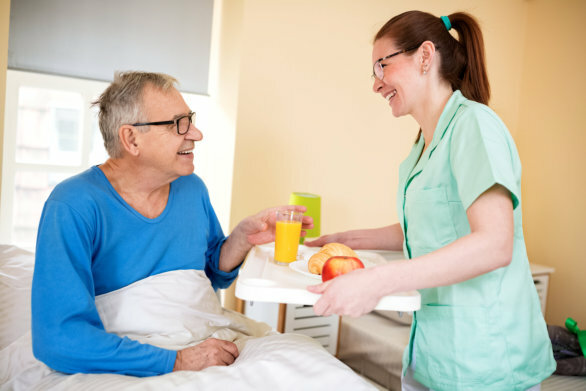 You can also ask for assistance from a home health agency in Ohio so that professional care staff can assist the hygiene needs of your beloved senior. This entry was posted in Senior Care and tagged Healthy living, Proper hygiene, Skin Care. Bookmark the permalink.